Of course, the most effective method against split ends - a pair of scissors. Although it is not a hundred percent, because the split ends do not appear as a result of rare cuts. Then come to the aid of other means. And I must say, with most of them, we know, because they - the permanent inhabitants of our refrigerators, cellars and storerooms. But not the one that is sold in the shop. It is necessary to make an egg shampoo own production. The composition is simple: a teaspoon of chopped rosemary (fresh is better, but you can use dried), two cups of hot water and one egg. Boil rosemary in hot water and leave for 20 minutes. Allow to cool. Break the egg into the broth and stir. Wash your hair with the resulting mixture as a regular shampoo, massaging the hair roots and tips. Papaya need ripe and juicy. Enough fruit halves, however, if the hair is thick and long, it is useful to the whole fruit. Remove the rind and seeds of papaya, squash flesh with a fork. Add half a cup of yogurt and mix. Got a great therapeutic mixture.And very tasty! Massage the mixture through the hair and scalp. Leave for 30 minutes. Then rinse. Castor oil - a valuable ingredient of hair care. It can be used separately as an oil wraps, but you can - by mixing it with olive oil in equal amounts. Apply the oil on your hair, wrap a warm towel on top, leave for 30 minutes. Then wash your hair with regular shampoo. This treatment is best done after the will wash your hair with shampoo. Take a tablespoon of heavy cream and half a cup of milk. Then massage into the hair, especially in split ends. Leave the milk cream on the hair for about 15 minutes, then rinse. Honey - a truly "our everything" in the protection of youth and beauty. And for split ends he will do his good deed. Mix honey with cream cheese (half a cup of cottage cheese and a tablespoon of honey). 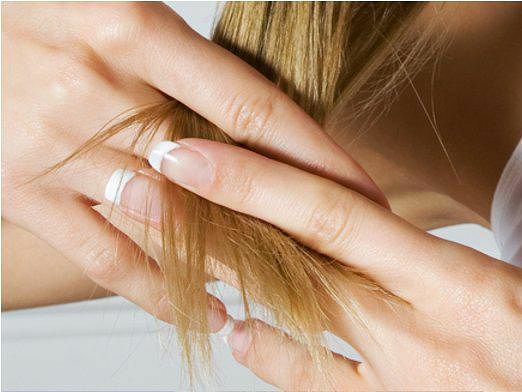 Massage your hair and ends, let the mixture remain at 20 minutes. Then rinse with plain water. In addition to the treatment of tips this mask will give your hair a good shine. Regular beer, the cheapest and non-brand is fine. Simplicity and beauty! Better not just rinse beer and a little massage and leave on hair for a while, the beer is better absorbed. There is only one problem - the smell of beer. A fragrant sprays and mousses for what? Do not get tired of this wonder fruit. How lucky those women who have a garden, you can grow an avocado! Well, in our stores these fruits also fall, and that did not pass by, buy on trial. Hair is very simple - mash with a fork to mash the avocado mixture and massage the hair and split ends. The longer you massage - the better. Or you can leave for 15-20 minutes on the hair, it's even more enhance the therapeutic effect. If the avocado add a tablespoon of olive oil, the hair will become more and shiny. Then you will simply wash your hair with plain water. Olive oil is necessary to heat and apply on hair, can massage. Wrap head with a towel or wear a plastic shower cap. After half an hour wash with shampoo.